Insect bites and stings may be caused by a variety of bugs. You may or may not know what bit you. 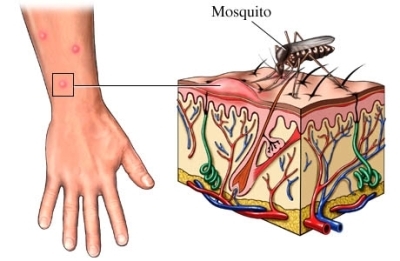 A bite or sting may go unnoticed or can cause irritating skin reactions. Most bites and stings can be safely treated at home. For some people, insect bites or stings can cause severe allergic reactions. These reactions will require prompt medical attention. If you think that you are having a severe allergic reaction, call for emergency medical services right away. If you have or suspect a severe allergic reaction, call for emergency medical services right away. Not all insect bites or stings require medical attention. If you have had a severe reaction, your doctor will ask about your symptoms and medical history. A physical exam will be done. You will be asked about the type of insect that bit or stung you. If possible, try to obtain a sample of the insect. Your doctor will use this information to understand what is causing your symptoms and how to treat them. Most insect bites and stings can be safely treated at home. If you know you already have a tick allergy, do not remove the tick. Instead, seek medical attention. Removing the tick may cause it to inject more allergen-containing saliva. Acetaminophen or ibuprofen can be used to reduce pain or swelling. Sometimes the insect or part of the insect may be left behind in the skin. Removing them will help the area heal and avoid further irritation or infection. To remove a stinger—Use a sharp edge, such as a credit card. Gently scrape the edge over the site to push the stinger out. To remove a tick—Use tweezers to grasp the tick by the head. Pull the tick gently but firmly up and away from the skin. Hold the tick just above the skin until it releases its bite. Ticks can carry infections like Lyme disease or Rocky Mountain spotted fever . The sooner you remove the tick the smaller the chance of infection. Note : If the tick's mouth breaks off in the skin, generally, it can be left there. The mouth will be pushed out during normal skin growth. Use insect repellents. These work against biting insects like mosquitoes. Reduce the amount of exposed skin. Wear long sleeve shirts and pants when possible. Avoid sweet-smelling perfumes, deodorants, lotions, hair sprays, and colognes. Stay inside at dawn and dusk. Mosquitoes are most active during these times. Stay away from areas where mosquitoes breed, such as areas around still water. Use caution around areas where insects nest. Areas include walls, bushes, trees, and open garbage cans. Be cautious in areas where spiders might be hiding. Areas include undisturbed piles of wood, seldom-opened containers, or corners behind furniture. Do not disturb bee or wasp nests. Keep foods covered as much as possible when eating outdoors. Cover outdoor garbage cans with tight-fitting lids. Remove any areas of still water from around your house. This may include turning over lids or pots around your yard that have collected rainwater. Use flea and tick control for pets. Regularly treat your home for fleas during warmer months. Treat fire ant mounds with insecticides. Anaphylaxis. EBSCO DynaMed Plus website. Available at: http://www.dynamed.com/topics/dmp~AN~T113858/Anaphylaxis . Updated August 22, 2017. Accessed December 7, 2017. Bug bites and stings. Nemours Kid's Health website. Available at: http://kidshealth.org/en/teens/bug-bites.html. Updated February 2014. Accessed November 11, 2015. Hymenoptera sting allergy. EBSCO DynaMed Plus website. Available at: http://www.dynamed.com/topics/dmp~AN~T114226/Hymenoptera-sting-allergy . Updated April 6, 2017. Accessed December 7, 2017. Insect bites and stings. EBSCO DynaMed Plus website. Available at: http://www.dynamed.com/topics/dmp~AN~T181055/Insect-bites-and-stings . Updated April 6, 2017. Accessed December 7, 2017. 11/7/2016 EBSCO DynaMed Plus Systematic Literature Surveillance http://www.dynamed.com/topics/dmp~AN~T181055/Insect-bites-and-stings : Australian and New Zealand Committee on Resuscitation. ANZCOR Guideline 9.4.3—Envenomation from tick bites and bee, wasp, and ant stings. 2016 Jan. Available at: http://anzcor.org/assets/Guidelines/First-Aid/ANZCOR-Guideline-9-4-3-Ticks-Bites-Stings-Jan16.pdf.